This is the premium with Nintendo land. Just bought from Grimsby Tesco for £74! Seems Tesco are clearing Nintendo stock! So deals so far are as follows. Are there any discounted games? Did you notice if the vita was discounted too? Some of those have been found cheap. May be worth going to Cleethorpes Extra to see what they have. Where there many units left in stock? I didn't even ask about the vita! Trip to Cleethorpes coming up! 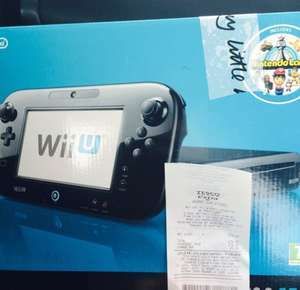 whats the barcode and product code WII 11.....? Rang for a Stock Check in Sandhurst and was told only available online (I quoted the catalogue number) - Best to check in-store! Hot! Online? Instore only I believe? Might have a look tonight, when I do my shop. The local one has a prices scanner, in the Gaming aisle. Nationwide Instore deals are a pain in the hole. Some of us have jobs and completely miss these goose chases. First world problems. None in London store, guess must be outside London area only. Check everywhere from North, East, South and West of London. And when you ask the staff to do a stock check, they will just say " if not, on the shop floor than we don't have it". Or " I don't think we sell wii u console in store, you just have to order on our website!" "Sorry!" None in London store, guess must be outside London area only. Check … None in London store, guess must be outside London area only. Check everywhere from North, East, South and West of London. And when you ask the staff to do a stock check, they will just say " if not, on the shop floor than we don't have it". Or " I don't think we sell wii u console in store, you just have to order on our website!" "Sorry!" Which liverpool tesco was it? I was hoping to go after work, are there any left? I hope you're joking, but am not sure. Hee hee I'd buy one off you at 150 but I am miles away. There were some in grimsby unless i got the last one. Only 8gb but i got one of them and a wii mini for 29 quid. Fairly happy. Cheers op. Called the Plymouth stores & was told that they only had Mario Kart bundles which are £199! Called the Plymouth stores & was told that they only had Mario Kart … Called the Plymouth stores & was told that they only had Mario Kart bundles which are £199! Grab one, hide it in store somewhere and come and collect it when price is slashed to £64 next week. Yes, went at lunch and nothing on shelves.. did you go? I'm going to apologize up front here as this is certainly a good deal if you can find them. It's just... do we really need a new post every time someone finds a Nintendo deal in Tesco's? Couldn't there just be a single catch-all thread instead. Quite aside from anything else this must be hell on earth for anyone employed there as they get inundated with queries about these fabulous bargains.